It has been a good year for first-time playwrights, which bodes well for the The Stage Debut Awards in 2018. First, at the Royal Exchange in Manchester, there was the debut of Kendall Feaver’s The Almighty Sometimes, which won the judges award at the Bruntwood Prize in 2015. In the last week alone I’ve seen a couple of crackers in Joe White’s Mayfly at the Orange Tree, and Ella Road’s The Phlebotomist at Hampstead Downstairs. I hope to see many more plays by these writers, but it’s by no means certain because too many fine first-time playwrights, or early career artists, fall by the wayside. Particularly if they are women. Women’s creativity and whose voices are heard and heeded in the wider world were explored in another play to open this week: The Writer by Ella Hickson. 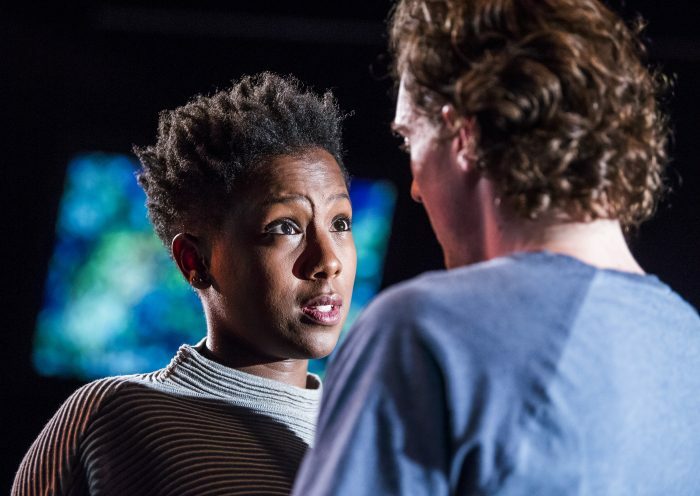 Hickson’s success with this new play at the Almeida, and before that the much-admired Oil, may seem charmed, but it was not plain sailing for her to make the leap from student playwright spotted at the Edinburgh Fringe to the mid-career place she occupies now. There is a significant difference between starting a career as a writer, or director, or any kind of theatremaker, and actually sustaining one over a long period of time. I recall once hearing Paula Varjack talking about the industry being like a medieval village where virginity is so prized that everyone celebrates the arrival of a new show by a new artist or writer in a manner that recalls the way bloodied sheets were once hung out in the village square for all to see. Paula Varjack: Exactly when will I stop emerging? That may lead on to a further commission or a commission elsewhere, but too often after that first production, writers find themselves left to sink or swim as producing theatres and companies turn their attention to the next bright young thing. Particularly if that first play was not a smash hit. The traditional bridges that take you from early-career artist to mid-career artist have crumbled away. Once writers could do it themselves by mounting a production of their play and learning by putting it in front of an audience. But now the costs of hiring a fringe venue, or taking a play to Edinburgh, are so prohibitive that is out of reach for many. It requires real tenacity to carry on unless you are well supported, and I sometimes wonder whether producers show enough duty of care to those whose work they initially support. We now look askance at projects where artists parachute in and work with a community, only to disappear again with a set of good reviews but no legacy for those left behind. So why do we treat our artists in a similar manner? I reckon we still misguidedly think there is something romantic about writers and artists suffering for their art. That it is not just their talent being tested but their grit. Emerging writers and theatremakers come cheap. You can throw £500 at an early-stage writer and they will be delighted. Or you can call something an “opportunity”, attach a few pennies and provide free rehearsal space, and everyone is supposed to be grateful. But you can’t eat rehearsal space, or pay for childcare with it, or buy yourself dream time. What writers really need are paid residencies and attachments, not the loose change a theatre found down the back of its foyer sofa. As Hannah Khalil observed in a blog this week, trying to be a playwright with no financial cushion is almost impossible. Most playwrights are still doing another job to support their writing long into their careers. The truth is that it’s very hard to sustain a career in the arts unless you are a) rich or have parental support, b) have a partner working in a non-arts related job c) have a lot of luck. d) Keep winning lots of playwriting competitions. Vinay Patel wrote a good thread on Twitter that explores what a successful career as a playwright really looks like. For many, sustaining a career in theatre has little to do with talent and more about being able to deal with crippling financial insecurity and not be so stressed by it that you can still write a play or make a show. Which is why I reckon that the Arts Council’s new £3.6million per year fund called Developing Your Creative Practice is a very good idea with the chance for individuals to access grants of between £2,000 and £10,000 to move their work and practice on. The closing date is May 16, but there will be three more application rounds this year, and for some it could provide that crucial bridge needed to support longer-term careers. Poll: Should the industry do more to support people with anxiety?